Research results are mixed regarding the use of tea tree oil for athlete's foot and nail fungus infection. It seems to work for mild to moderate acne. Although it may not work as fast as modern topical remedies, it does offer less skin irritation. A proper tea tree oil dose depends on your specific health status and diagnosis. Beware of possible skin irritation and swelling. Boys who haven't reached puberty should not combine tea tree and lavender oils. Using copious amounts of tea tree oil on the skin could cause mobility and coordination problems, muscle tremors, weakness, and inhibited brain function. Herbs and other supplements aren't subject to government regulation. Safety and consistency of products cannot be guaranteed. Effects may vary according to brand and batch. Do not use tea tree oil during childbirth as it may inhibit contractions. Do not use tea tree oil if you are allergic to plants in the myrtle family, balsam of Peru, or benzoin. 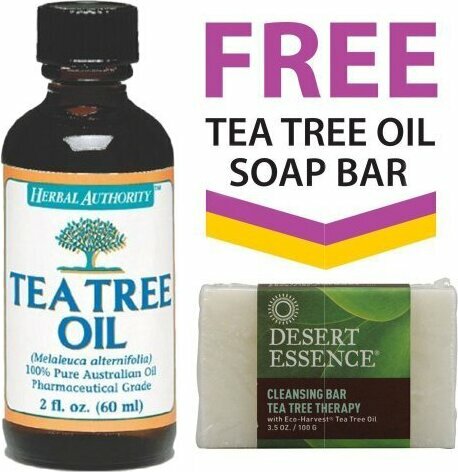 Sign up for future Tea Tree Oil deals and coupons! Click the button below to sign up for future Tea Tree Oil deals, news, and coupons! 16 Oz. 4 Oz. 2 Oz. 1 Oz. $40.99 This is a Buy 1 Get 1 FREE offer! $6.30 This is a Buy 1 Get 1 FREE offer!